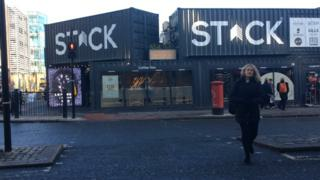 Newcastle upon Tyne's shipping container complex, called Stack Newcastle, opened in 2018. It is made from more than 50 converted shipping containers, and operators said it received 50,000 visitors a week on average within six months of opening. It was installed in the city centre on a derelict site that used to be home to an Odeon cinema. Now the land is occupied by dozens of small, independent businesses that are trading from converted shipping containers. "We've really enjoyed the opportunity to be able to trade in the middle of the city," said Andy Barton, who sells freshly-made pizza from a unit in the centre of the complex. He said it would normally be "too expensive" for his start-up business to be based at such a prime location. The complex is temporary and only has permission from Newcastle City Council to be there for three years. In 2021, the site is due to be cleared for redevelopment. Other container communities offering low rent and more flexible leases have helped small businesses to branch out into bricks and mortar premises. James Leay, from Make Shift, a company behind the Pop Brixton container community in London, said more than 25 of its tenants had moved to alternative locations since it opened on a former car parking site in 2015. "It is relatively easy to start your business from a bedroom or to test an idea on a market stall but that next step is a 15-year commercial lease and that comes with big premiums," he said. "We answer the space gap. We take people on that journey from a market stall and take them three years later into a bricks and mortar space." In 2011, Boxpark at Shoreditch in London was the first food and retail park made of refitted shipping containers to open in the UK. How many others have followed its lead is hard to say as there is no central register, but after going through newspaper cuttings and councils' planning records, You and Yours found at least 13 container complexes were launched in British towns and cities during the three years from 2016 to the end of 2018. Image copyright By The River Brew Co. Some are temporary, others are not. The list is not exhaustive so it is likely that other container communities opened during that period. For temporary projects on plots of land that are due to be returned to their owners, the challenge can be making enough money to cover set-up costs. A total of £1.9m was spent installing Pop Brixton on land owned by Lambeth Council. Even though its operators say it makes an annual profit of around £400,000 a year, they acknowledge that it would have made a loss if its lease had not been extended from three to five years. It is now due to close in 2020. "I think Pop was a real experiment," said Mr Leay. "I think what you are seeing from local authorities now is understanding that these things really need five or 10 years not two or three years." In Newcastle upon Tyne, some existing businesses backed plans for its shipping container park but others objected to it, and there are worries that it is competing with, rather than complementing, existing retailers. Stack Newcastle's operations director, Kevin Walker, maintains it is bringing people into the city and puts its success down to the events that it hosts, such as live music, pet and fashion shows, as well as its mix of independent shops, bars and food outlets. "We have been inundated with different councils looking to do similar schemes on land that would normally just be standing empty," he said. "I do think it has got legs probably for 10 years if I am honest and then I think something else will come along. Let's just enjoy the next 10 years, popping these things in wherever we can."